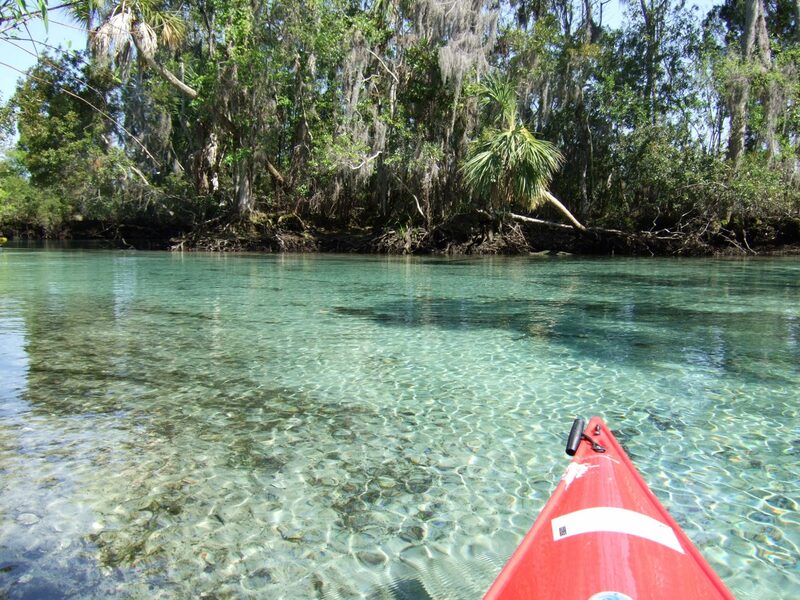 With so many options, it’s hard to find great places to go kayaking in Florida. While there are tons of beautiful areas, we’ve put together a list of the best places that you can dip your paddle and go kayak. 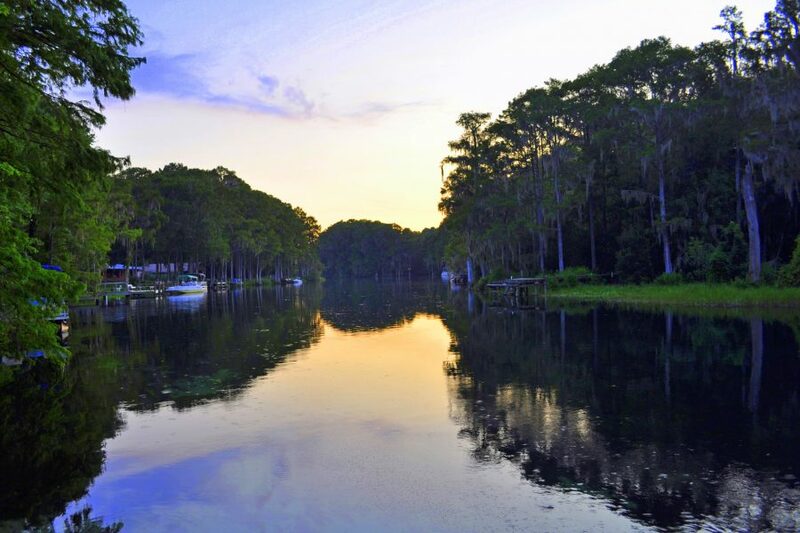 Located in Dunnellon, this river is 5.7 miles long. In most areas, the water is less than 10 feet, but there are some areas where the water is around 25 feet. The way the land is situated is quite unique. You can be in an area that’s 25 feet deep then take 2 steps and you’ll be in an area that’s only 10 feet. This means you should always wear a life jacket! This river stays at around 73 degrees all year round and is home to various fish, vegetation, and other types of wildlife. The crystal clear waters are beautiful especially with the sun shining down on it. The Manatee River is a whopping 36 miles long! That is a lot of space for kayaking! It starts in Manatee County and feeds into the Gulf of Mexico. You should always take precautions with this river because some areas might be shallow, while others might be extremely deep. Since it feeds into the Gulf, you never know how it will be. 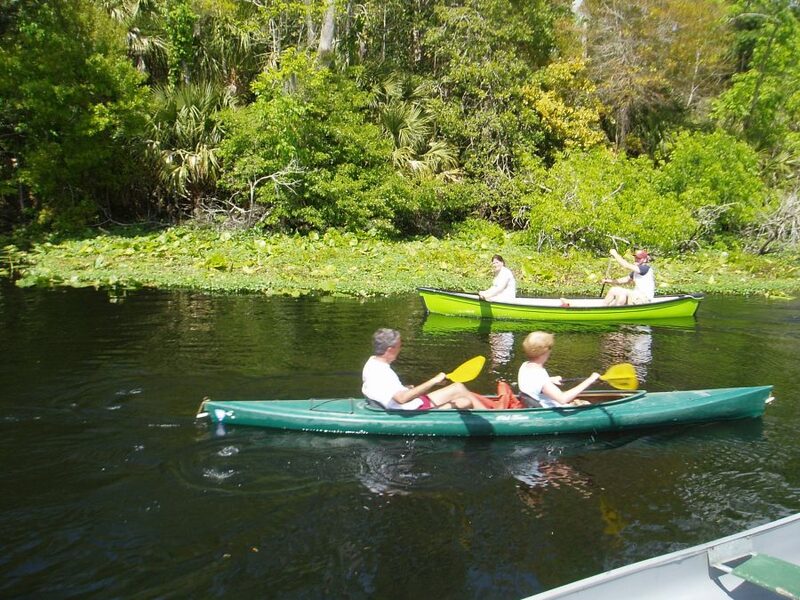 Some of the animals you can expect to see while kayaking here are: alligators, herons, manatees, dolphins, and various fish like bass and bluegill. One thing to keep in mind is that there are occasional bull sharks in this river. In this state park, you can kayak in the Ichetucknee River. This river is around 6 miles long and 20 feet wide. The water is usually right at 5 feet deep in all areas. Not only is this water crystal clear, but it stays at a warm 72 degrees all year round. 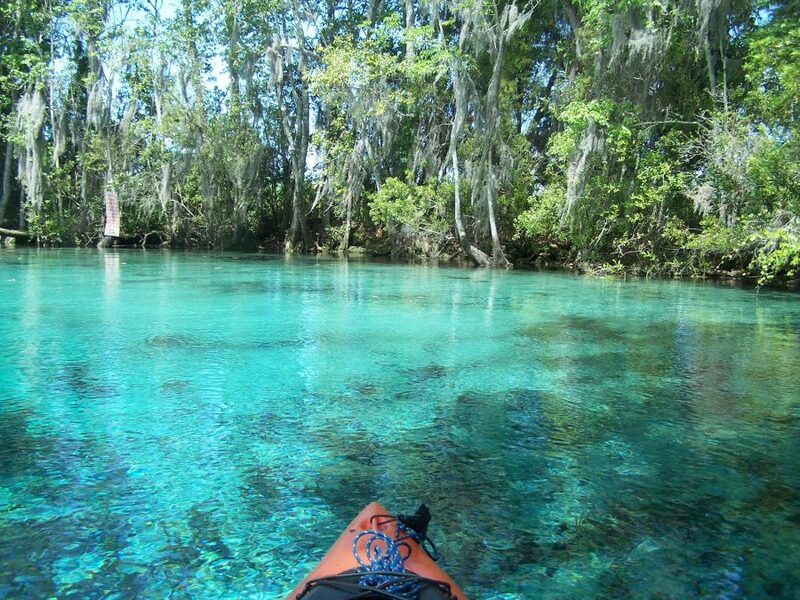 While kayaking, you’ll be able to check out some of the other springs in this state park! There are so many different animals you can see while on your trip. Some of those are: wild turkey, belted kingfisher, wild boar, catfish, and North American river otter. 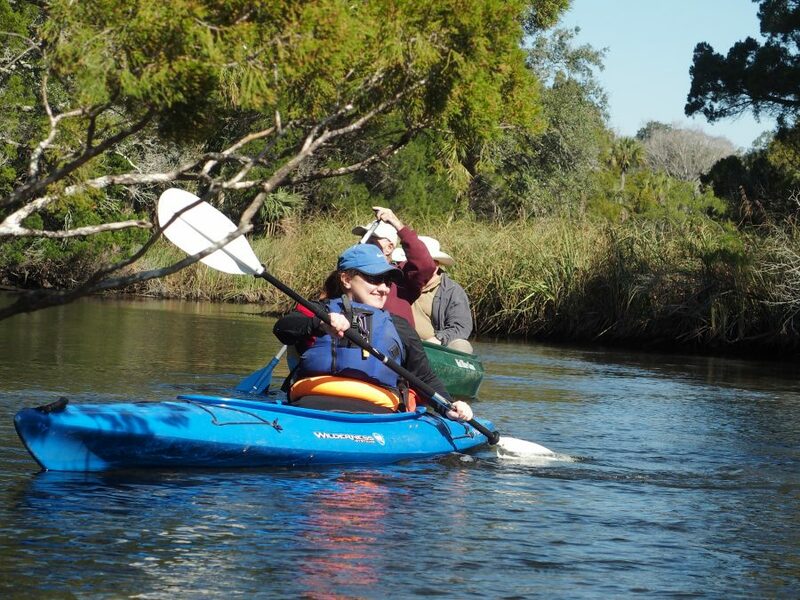 If you happen to go in the winter months, you might get to catch a glimpse of a manatee! This body of water is actually part of the Crystal River. It has 3 different springs, which is how it got its name. In this area, only kayaks, swimmers, and canoes are allowed in the area. They have a concrete barrier to stop boats from getting in. One thing to keep in mind is that the land around the springs is privately owned, so you there isn’t anywhere to tie up your kayak or canoe. This area is also filled with several manatees and it’s actually one of the sanctuaries located in the Crystal River. Looking into the clear and beautiful water is something you’ll remember forever! 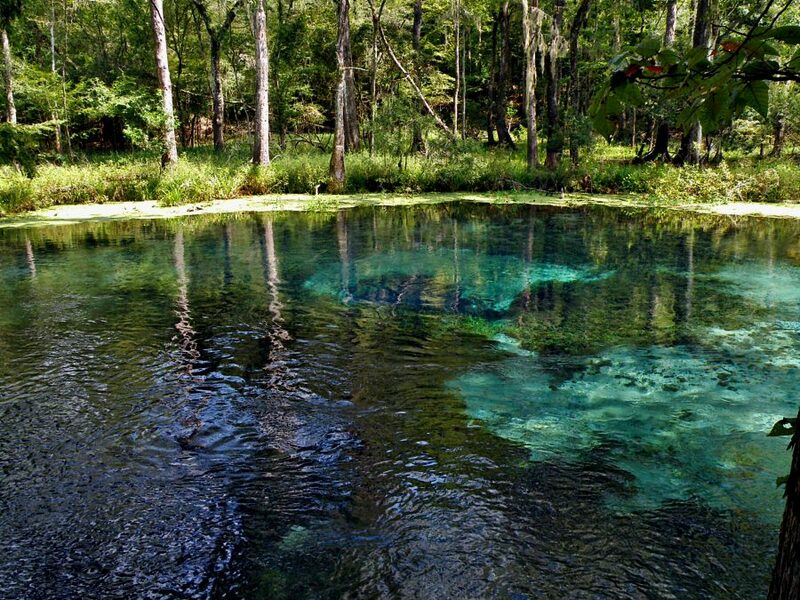 Located in Ocala National Forest, this natural spring is called The Springs by people who live in Florida. The national forest is subtropical and Juniper Springs is oval shaped with several limestone caves. It’s around 135 feet long and 80 feet wide. This crystal clear water doesn’t get any deeper than 21 feet, but there are some areas that are much shallower than that. There are many different animals and fauna that you can see here. Some of these are: turtles, various fish, raccoons, and various birds. The water is usually warm, so don’t be afraid to jump in and take a little swim! This river is 7.4 miles long and feeds into the Gulf of Mexico. It got it’s name from Seminole Indians and it means little springs. The water temperature stays around 72 and 74 degrees all year round. Along with crystal clear waters, you can see many kinds of animals and plant life. 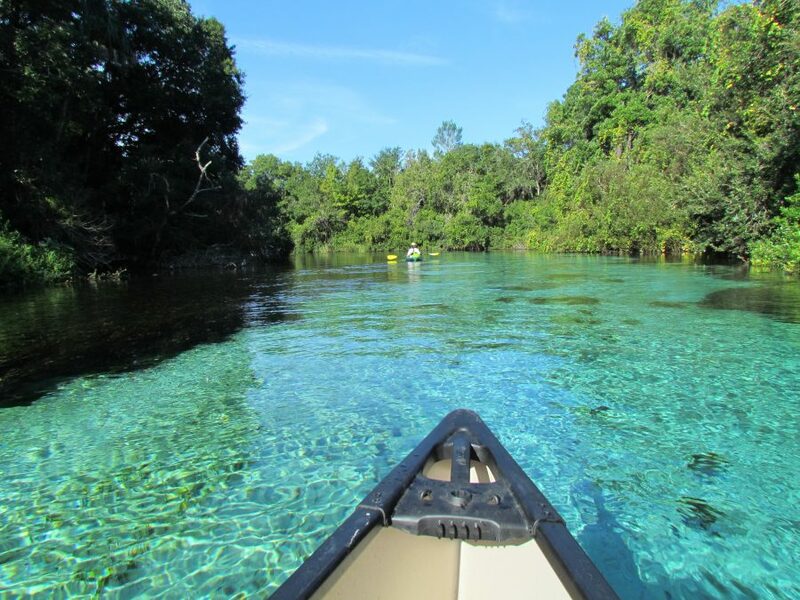 This river is also very well known for it’s spring, which is the Weeki Wachee Springs. This spring is 150 feet wide and around 250 feet long. This is also the deepest spring that occurs naturally in the United States. While the waters aren’t crystal clear, you can still see some beautiful sights. 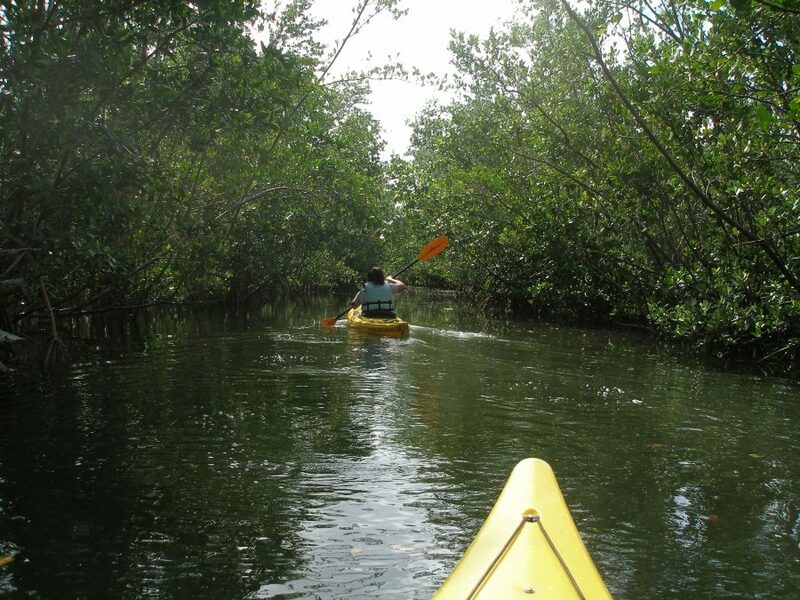 Not only can you kayak through the creeks, but there are also lagoons. 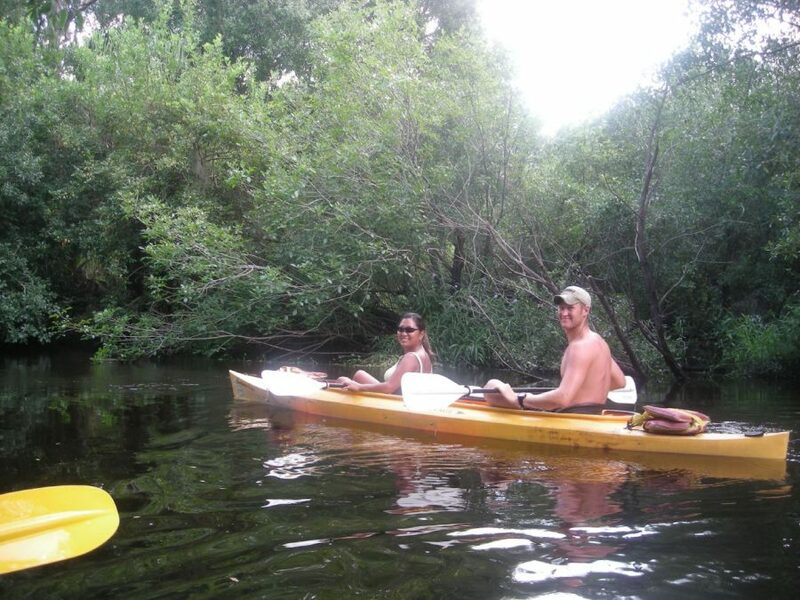 The creeks are surrounded by beautiful mangroves and other Florida vegetation. This is the perfect place for a beginner because the water is usually very calm. You should still wear a life jacket though! In addition, you’ll be able to view some of the wildlife that are native to Florida. Hermit crabs can easily be seen by the mangroves and you’ll see many birds if you go in the winter months. There’s also a chance that you’ll get a glimpse of the beautiful manatee or dolphin! 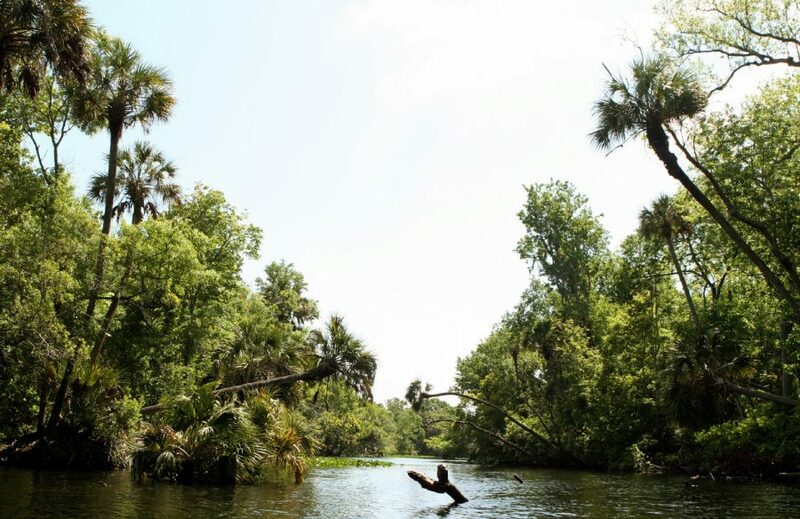 Wekiwa means flowing water and the name comes from the Native Americans that lived in the area. The water here is crystal clear, so you’ll be able to see all the wildlife living in the water. 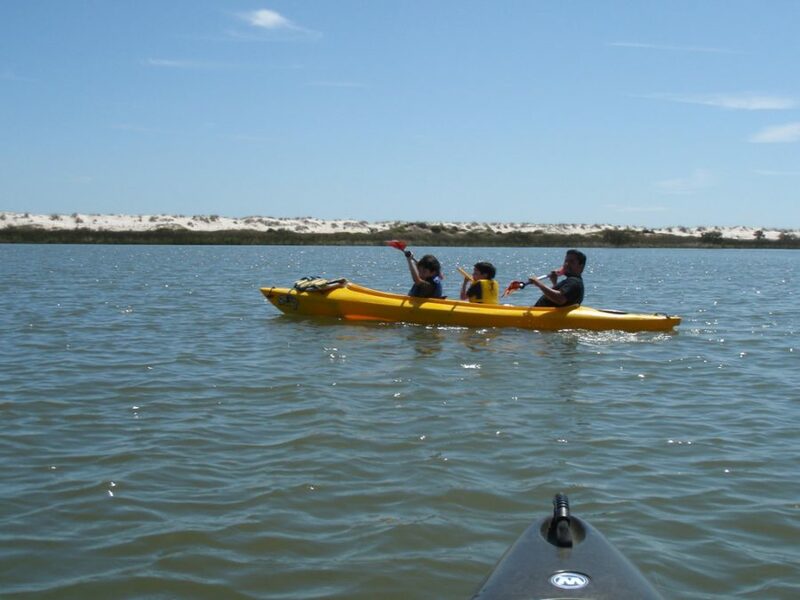 The entire spring is around 16 miles, so you’re sure to enjoy a full day of kayaking! In addition, you’ll be able to see various wildlife and wonderful ecosystems. Some of the wildlife you might see on your trip include: manatees, alligators, deer, otters, and bears. Remember, land animals might come right up to the water, so you won’t just see the ones that are actually living in the spring. The water here is extremely clear, so you’ll be able to see all the schools of fish. In addition, you’ll be able to see some of the springs that are in the river, including the Seven Sisters. There are also little pathways that you can go down and they’ll bring you out to other little bodies of water. The waters are usually calm, which makes it great for beginners or for people who just want to relax and take in all the scenery. There are also all kinds of wildlife you can see. Some of these are: various birds, otters, and manatees. The Silver River leads into Silver Springs. The river goes on for about 4.5 miles before it joins with the Ocklawaha River. While the water is usually calm, some areas are very deep, so you want to make sure you always wear your life jacket! The water has a silver look, which is where it most likely got it’s name. There are some pretty cool animals around this river. For example, Rhesus monkeys were actually released here in the 1930s and they became feral. You can still see some of them in the trees and banks today. You can also see ospreys, turtles, and anhingas. Located in the Florida Keys, this body of water is around 25 miles long and feeds into the Atlantic Ocean. With this being the case, the water might be calm one day and be very choppy and chaotic another day. It’s also very deep, so you won’t be able to touch the bottom in most areas. All of the coral reefs, wildlife, and vegetation are protected in this area. The name comes from a late Miami editor by the same name that was big on helping preserve nature and wildlife. Some of the amazing things you’ll be able to see are: tropical vegetation, sea turtles, and beautiful coral reefs. The beautiful water in this state park is relaxing and enchanting. While it might be calm most of the time, you should still wear your life jacket because the water is extremely deep in some areas. The water stays warm all year round, so you can even hop in for a short swim if you wanted to. Not only will you see some beautiful vegetation, but you’ll also see many animals. Some of those are: turtles, herons, otters, deer, and various kinds of fish. There’s nothing quite like watching a beautiful sunset or sunrise while sitting in your kayak on calm and beautiful waters! This river is 9.3 miles long, which means you could make it an all day adventure. 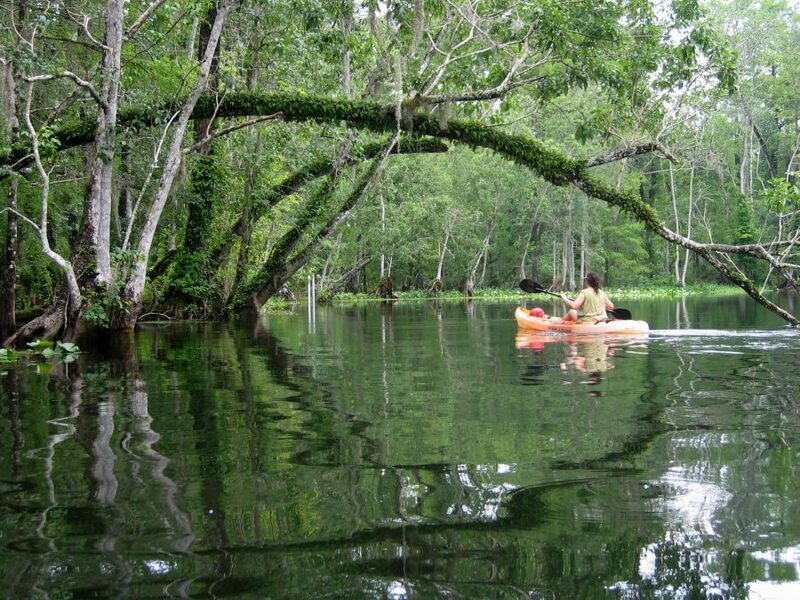 You’ll be able to kayak under beautiful and lush canopies, while looking down into the clear water. Not only will you be able to see fish, turtles, and birds, but there’s a chance you’ll get to glimpse the beautiful manatee! If you do get to see these creatures, they might swim around and under your boat or eat some of the lush vegetation! With so many beautiful areas, you’re sure to get some wonderful photos! All the colors combine to make a unique and enchanting scene. If you want some relaxation while having the chance to dock and check out some historical sites, then this is the perfect place for you! 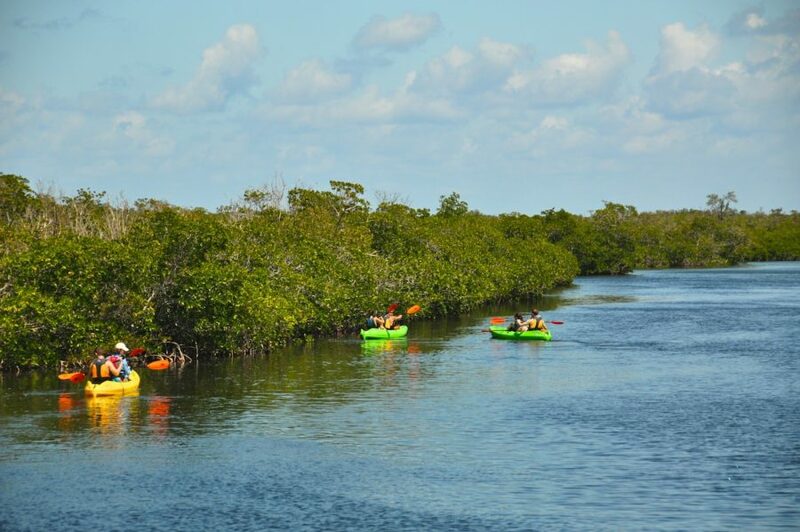 Now that you know about the best places for kayaking in Florida, you’re sure to have a great time! Grab your friends with some drinks, and go have some fun!